I laughed. I don’t exactly have the power to get him every new meter that comes out as easily as I once did. Back in our earlier years of diabetes management, glucometers were pretty basic. Asking a rep for a new meter was not a big deal because they wanted your test strip business. Today many meters are now small computers. They analyze trends and do all sorts of tricks. This means that they cost a lot more money than they once did. Cost or not, a new meter in our little world of diabetes has always been a big deal. Needless to say, I was really excited when I received the press release from Auto Control Medical stating that they were launching the meter that we had looked at! Auto Control was the distributor for many great diabetes tools like the Cozmo insulin pump and the Cleo infusion set. It was therefore not surprising to see them involved with another cool innovation. After a few emails, I was able to set up a time to chat with a representative from Auto Control and get the details on this new toy glucometer. According to the press release, “the Dario Diabetes Management Solution is a compact all-in-one system that helps people with diabetes monitor blood sugar levels and proactively manage their disease using their smartphone or tablet…Approved by Health Canada, Dario connects via headphone jack to turn a mobile device into a glucose monitor, and comes equipped with a lancing device and test strips to take blood samples on the spot. It provides the diabetes patient’s real-time and historical blood glucose data to spot patterns, recommend treatments and support behavior changes. Its web interface also makes it easy to get upgrades and share health information with healthcare providers and loved ones. 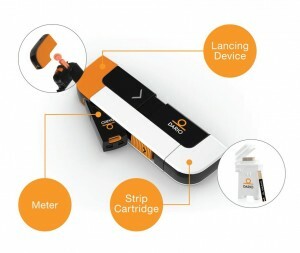 As an all-in-one system, Dario combines a lancing device to obtain a blood sample, a proprietary disposable test strip cartridge with 25 strips, and a glucose meter that’s driven via the user’s mobile device. Unlike conventional glucose monitors, there is no carrying case or batteries to replace, and the system works on both Apple and Android devices.” You can see why I was excited about this new technology! After speaking with the Auto Control representative, my enthusiasm didn’t wane. Not only was this meter compact, like my son’s beloved iBgStar, but it would not become obsolete or require me to search high and low for new adapters when he upgraded his cellphone. 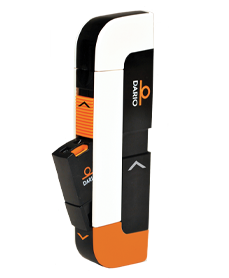 Dario’s patented technology allows the user to plug the meter into the phone jack and you are good to go! 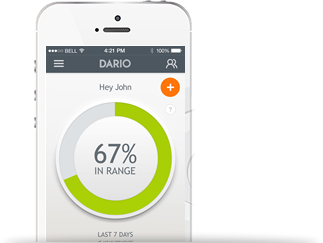 The Dario offers data sharing (great for nosy parents like me!) and is extremely feature rich according to Auto Control. I was told that app updates will make this meter much more customizable than the competition. By updating software through apps, the meter should also have more longevity and not become obsolete before you have finished the first 100 test strips. I haven’t had a chance yet to download the myDario apps yet but I was told that users are free to download and play even before purchasing the meter. Yes, you do have to purchase the meter but again, the meter is less than some comparable products. The current retail price is $39.95 but some short-term offerings are being made to help reduce the cost. Please check with your pharmacy or www.mydario.ca for the exact details. 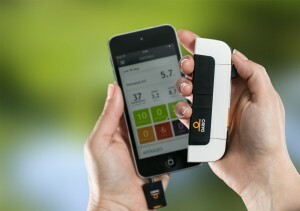 The Dario diabetes management tool has a meter, lancing device and 25 strip container in one small location. It uploads to most smartphones and offers detailed carb counting applications similar to those found on some smart insulin pumps. It has a standard warranty program and offers replacements on a case by case basis. The meter and test strips are covered by most private insurance companies and will be added to provincial formularies in the coming months. The next step for us will be to test it out in the real world. My son got his wish and will be having a Dario delivered to him in the coming weeks. I have told him that I want a full review from him on what he thinks about this new meter. I will also be downloading the app from theMyDario site and seeing what I think of things from that end. I love new diabetes toys!